800 students from 40 nations. One of the best student-tutor-ratios in Europe. 30 instead of 300 fellow students with you in class. These are just a few facts about the University of Liechtenstein. And even more importantly, we are an innovative thinking space for business and architecture in the heart of Europe. Here, you study in accordance with Swiss and international quality standards. Personal, practical, future-oriented and with the best prospects for your academic or professional future. Do you want to know more? You can. Do you want to benefit from a family-like environment for your personal development? You can! Do you want to gain skills that are relevant for the future? You can! Do you want to experience space for self-realisation and entrepreneurship in order to create great things? You can! Do you want to enrol on a course with the best perspectives? You can! Do you want to expand your horizons during a semester abroad or an internship? You can! 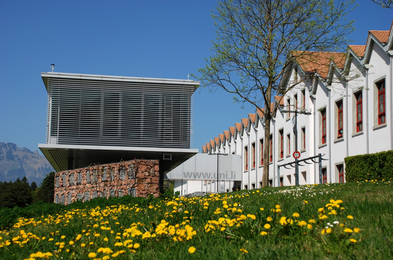 Do you want to study on an inspiring campus with high recreational quality? You can! Individual advice: Our course managers are happy to answer your questions and provide you with information about our study programmes. Don't miss a thing: We will keep you up to date with targeted mailings about the study programme of your choice. Our study brochure offers you a first impression of studying at the University of Liechtenstein. For the seventh consecutive year now, the Hilti Chair of Business Process Management held the Winter School for bachelor’s students from around the world at the Institute of Information Systems. Master students of the study programme Information Systems win the local qualifying round of the Accenture Campus Innovation Challenge 2018 at the University of Liechtenstein with their project «Augmented Tumor Cure». On June 22, the students will present their project again to experts at the regional final of Switzerland in Zurich. Vaduz/FL – In order to strengthen the topic of IT security, the Hilti Family Foundation is supporting the newly established endowed chair “Data and Application Security” at the Institute of Information Systems at the University of Liechtenstein. Around a year after Michael Hilti announced this during University Day, the chair, for which Prof. Dr. med. Pavel Laskov was appointed on 1 April, has begun its work. The University of Liechtenstein has been awarded in April 2018 already for the fourth time by the AIS, the Association for Information Systems, for the Liechtenstein Chapter of the AIS and its outstanding work within the area of Information Systems in the year 2017.